It is discovered just off the Southern California coast. But whether the astonishing finding – an undersea deposit of frozen methane — can be harnessed as a potential energy source is unknown. There has been a growing interest in tapping methane hydrates in recent years that form at low temperatures and high pressure in sea-beds and in Arctic permafrost. 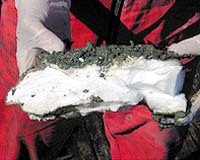 The methane hydrates are ice-like crystals. The methane trapped, previously known as frozen reservoirs around the globe, could power the world for centuries, as scientists estimate. Believed to be substantial in size, the newly discovered deposit was found about 15 miles off the coast at a depth of about 2,600 feet — at the summit of an undersea mud volcano. When they came across the volcano, scientists were conducting an unrelated study that sits on top of an active fault zone in the Santa Monica Basin.